Pythium first appears as circular reddish brown spots in the turf, ranging in diameter from 1 to 6 in. In the morning dew, infected leaf blades appear water soaked and dark and may feel slimy. When spots are wet with dew, purplish gray or white cottony fungal mycelia can be seen on the outer margins of the spots. 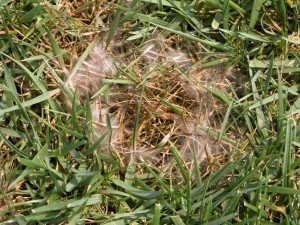 Infected grass plants collapse quickly, and when conditions are conducive, spots may coalesce and large areas of turf can be lost in a short period of time (overnight). Pythium blight survives in the thatch and soil as a water mold until proper conditions occur for it to become pathogenic. As a warm-weather disease of cool season grasses, the disease is most destructive when temperatures are between 85° and 95° F (29.4° – 35° C). When evening temperatures average 68° F or higher, outbreaks will typically first appear in low areas, or poorly drained areas where soil moisture is maintained. Humid periods further favor disease development. Management of Pythium includes improving drainage and air circulation, avoiding over watering, aeration, reducing excess thatch, and avoiding nitrogen fertilizer during warm weather. A lime treatment may be necessary.